an appointment time is changed or modified, etc. Here are the steps (along with annotated screenshots) on how to do this. If you are an admin, you can adjust these settings for other users from the admin users page. Step 1: Click your user-icon > then click "My Profile" from the drop down menu (illustrated above). Step 2: Verify your email address is correct. 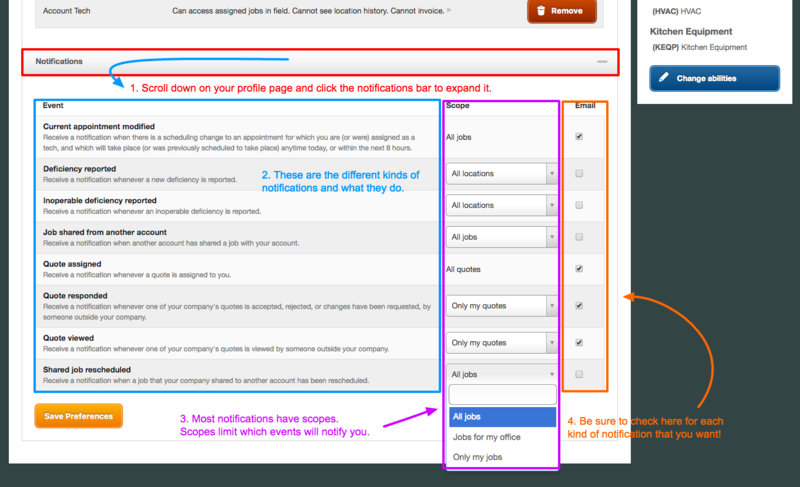 Step 3: Scroll down to the "Notifications" bar on the "My Profile" page, and refer to the illustrated screenshot below. Can I set up push notifications for the mobile app? Push notifications are not supported at this time for mobile. The ServiceTrade mobile app is also for tech use only at the present. How can I set up text messages / SMS notifications? While we don't directly support text message/ SMS notifications, there is a cool way to do this anyway. SMS/MMS messages are email-based under the hood, and it turns out you can send email (such as a ServiceTrade notification) directly to your text / SMS address. To do this, simply enter your text / SMS address into your account profile for ServiceTrade. What is my Email-to-Text/SMS Address? Your email-to-text address typically is: "number@mobilegateway.com" where "number" = your 10-digit phone number & "mobilegateway.com" = your mobile carrier's gateway. Below are a list of common mobile gateways. What triggers an appointment modified email? So, if a preexisting appointment is moved into (or out of) this window, or if a new appointment is created and fits within this window, any assigned techs with this notification enabled will receive a notification. What do appointment modified emails look like?